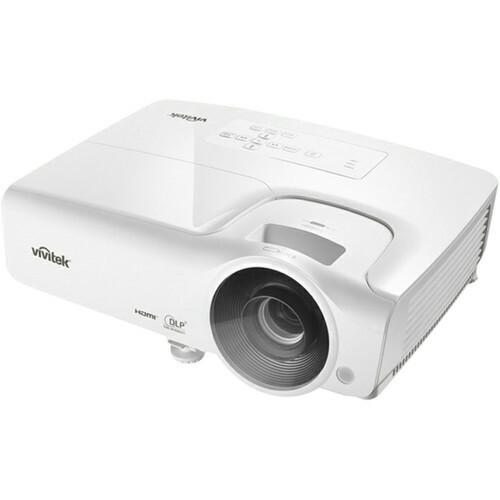 Enjoy bright 2D and 3D content in most settings with the Vivitek DH268 3500-Lumen Full HD DLP Projector. Its 3500 lumens of brightness overcome ambient light in many rooms while Full HD 1920 x 1080 resolution helps keep images and text clear at most viewing distances. Its 1.28 to 1.56:1 throw ratio allows you to install the projector near the back of the room without losing focus. The DH268 features two HDMI inputs with HDMI 1.4 support for 1080p and 3D content. It also has composite, S-Video, and two VGA inputs for legacy analog sources, plus a VGA output to daisy-chain multiple projectors or displays. A built-in 2-watt speaker and analog audio input and output ensure that audio accompanies your video. A VGA cable and IR remote control are included for instant setup and convenient control. Box Dimensions (LxWxH) 16.7 x 13.0 x 5.9"